The third annual Blended Burger Project™ ended with a bang. The contest closed with entries from 414 restaurants* in 45 states and more than 400,000 consumer votes. 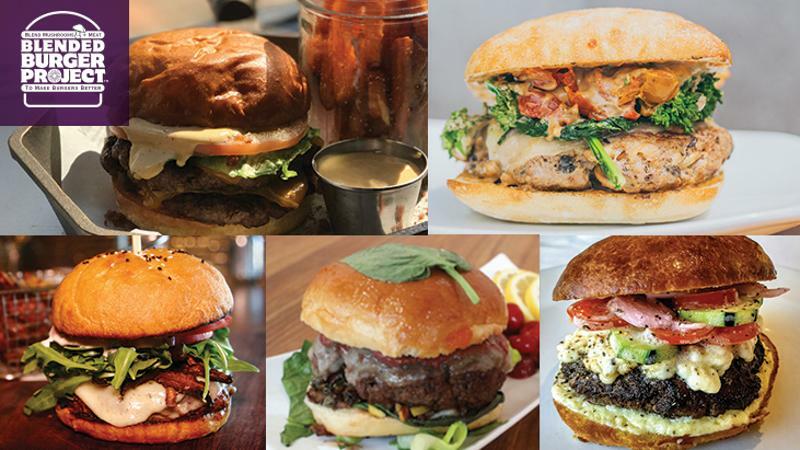 Over the past nine weeks, the Blended Burger Project™ created a buzz on social media with more than 4,700 unique posts on Instagram and Twitter using the #BlendedBurgerProject hashtag. Bareburger, New York, N.Y.– The Porchetta Burger is a 50/50 mushroom and wild boar blend, topped with a black-garlic aioli, broccoli rabe, oven-roasted tomatoes, aged provolone cheese on a ciabatta bun. The Bistro at Topsail, Surf City, N.C.– The Goomba Burger is local grass-fed Mills Family Farm beef blended with confit oyster and portobello mushrooms, topped with havarti, shiitake "bacon," lemongrass aioli, heirloom tomato and baby arugula on a house baked bun. Cedar’s Café, Melbourne, Fla. – Brevard’s Taste of Summer Burger is a blend of mushrooms and lamb on an apricot- and liquid-smoke-glazed bun, with sour cherry mustard, basil, brie and a herb lemon caper walnut relish. VINTAGE Kitchen, Norfolk, Va. – The Backyard Burger is grass-fed beef blended with confit oyster mushrooms, aged double cheddar and cracklin', charred ramp mayo, bacon rust, cab franc molasses, crispy hayman potato straws, coffee salt, demi-pain perdu and brown butter mornay, cooked in a cast-iron skillet. The Mushroom Council thanks all the chef participants and those who casted their votes daily. Further show your support for the blend by pledging to be a Blenditarian and do better for your health, flavor and sustainability. When you pledge to be a Blenditarian, you will unlock an exclusive recipe booklet featuring more than 10 blended burger recipes by some of the country’s top chefs. For ideas and inspiration for making The Blend at home, visit www.Blenditarian.com.